The Department for Transport (DfT) has "wasted an opportunity" to show leadership on road safety, transport committee chair Louise Ellman has said. She accused ministers of trying to hide their responsibilities for improving road safety with "generalised talk" after a committee report on the issue. July's report said the government lacked leadership, after the first rise in road deaths for almost a decade. The government said it was focusing on ways of reducing the risk of accidents. 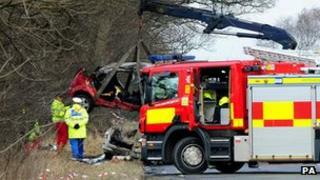 In 2010-11, 1,901 people were killed on Britain's roads. That is 51 more than the year before and the first rise since 2003. The largest increase was among pedestrians, where the number of deaths rose by 12% to 453. While deaths among cyclists and motorcyclists fell, the number of drivers and passengers who died rose 6% to 883, while more than 25,000 road users were either killed or seriously injured in total. The committee highlighted the fact that road accidents were the main killer among 16-to-24-year-olds and called for more help to keep young drivers and cyclists safe and to improve the design of roads. Mrs Ellman said she was disappointed with how the government had responded to the committee's concerns. She said: "The DfT has wasted an opportunity to demonstrate focus and leadership on road safety. "Generalised talk about everyone playing their part to bring road casualties down should not be allowed to hide central government's responsibilities to keep local authorities, the police, other agencies and the public fully focused on delivering significant and sustained improvements in road safety. "I am particularly disappointed that the government hasn't accepted the committee's recommendation to initiate an independent review of driver training, especially given the high casualty rate for young drivers." She said she would look carefully at new government proposals to improve the safety of young drivers, expected in the next few weeks. "We will also be watching closely over the coming months to see if the department provides significant pro-active leadership in other areas of road safety not least that relating to cyclists and motorcyclists," she added. The DfT said: "Road safety is an important issue and government continues to focus on effective ways of reducing the risk of road accidents. "Since the publication of the Strategic Framework for Road Safety last year, the government has continued to focus on its vision of empowering local decision-makers, improving driver training and a more targeted approach to enforcement."